For a soon-to-be woman in engineering in the hot climate of Delhi with no AC anywhere she lived or studied, this sounded like a good start. Computer Science engineering it was for me! Soon after, I started to really understand the significance and the impact that computing could make in the world. As a computer science graduate, my skills were in great demand. I started my career working on cutting edge technologies with a multi-national firm. I was creating, I was innovating and I was impacting people all around the world. Fast forward to today; computing is even more pervasive, computing jobs still on the rise and high paying. But, where are the graduates? Our children are savvy computer users. What it, they progressed beyond being merely computer users? What if, they could understand the creative powers of their devices? What if, they could learn of ways to express their creativity using their devices? What if, they could create something using the computer? More than 4 in 5 parents and more than 6 in 10 teachers, principals and superintendents say computer science learning opportunities are equal or more important than required courses. While learning computer programming, a child expresses her creativity as a game with characters and landscapes as unique as she is. There are polka dots on her buildings and flowers on the street where her equally appealing character goes on a mission to drive villains out of her imagined and created digital world. While learning about website designing, a young lady puts imagination of her future store into words and pictures as she designed the digital web pages for her store. An artist in making or perhaps an entrepreneur? A group of children collaborate to make robotic animals leading up to their own petting zoo! Tell us your thoughts about computer science for children. By: Moni Singh, Founder and CEO, STEM for Kids. STEM for Kids® provides educational enrichment in Robotics, Engineering and Computer Programming for children ages 4 - 14 through camps, afterschool programs, in-school field trips, workshops in schools and outside community spaces. National and international franchise opportunities are available for single and multi-units. Entrepreneurs with a passion to impact their community through education can learn more and apply at the STEM For Kids website, www.stemforkids.net/franchise. To STEM or to STEAM? While learning about simple machines and engineering of moving things, a child makes a design for his model car and expresses his creativity through drawing. Sharp arrows pointing forward and painted in black on the sides of his car clearly depicting his desire for speed and full speed ahead. While learning about website designing, a young lady puts imagination of her future store into digital web pages. An artist in making or perhaps an entrepreneur? While learning about rocket propulsion, future engineers devise their itineraries through the Solar System and the Universe. Many have stops planned for Europa to discover water, some will go as far out as our closest Blackhole to feel its pull, some will circle around the Solar System, some plan to venture to the Asteroid Belt. Moreover, their exquisite designs and expressions of their rockets are as unique as their itineraries. A group of children make robotic animals leading up to their own petting zoo! Wondering about structural stability and strength, a group of children decide to enact and tell their Civil Engineering story of the "three little pigs". Thinking through mathematical sequences, a classroom of students makes paper snails. These snails are made to artistic perfection with good proportion of coloring while utilizing a mathematical principle used in architecture. In their quest to design catapults that shoot the farthest, a group of young engineers-in-training research the history of catapults, learning about the various designs tried in the olden ages. These are just a few examples of delivering on our promise of hands-on engagement with our STEM programs. 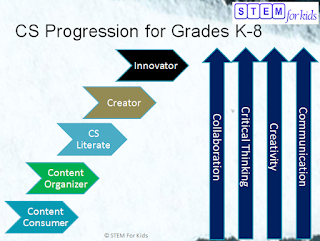 STEM means Science, Technology, Engineering and Math. As I had discussed in one of my early posts (First things first... back to basics), for the colors of STEM to really shine, we need a foundation (like a canvas or paper). That foundation is the core skills. What core skills do we emphasize and seamlessly integrate with our programs? These are the 4Cs - Communication, Collaboration, Critical Thinking and Creativity – foundational pillars for success in this century. Proponents for a balance of art with sciences have coined the term STEAM. STEAM is Science, Technology, Engineering, Arts and Math. Think back to the example activities at the top of this post. What do you think - do they represent Science, Engineering, Technology, Math, Arts, History, Language, Role Play or a healthy serving combining them all in varying proportions? 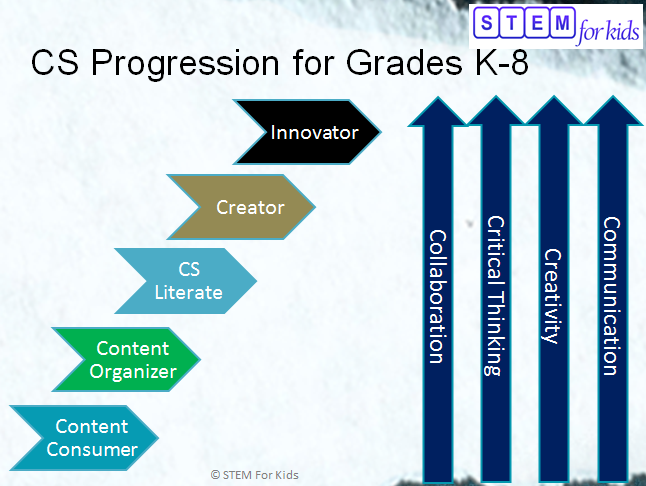 So, whether you want STEM or STEAM for your kids or may be STEAMH (H for history) or any other combination, know that STEM For Kids is STEM with the foundation of 4Cs stretching your child's imagination and learning through the use of artistic, linguistic, technical and other forms of expression. New Year begins with a new set of resolutions. Four weeks into 2016, now is a good time to check back on those - how many did you keep? How many just stayed a wish? I learned this one the hard way … when I had developed the “11” lines between my brows! When work takes a turn for the worse and unexpected events happen, we get engulfed in figuring out what happened and how we fix it. Those are the times when you need to force yourself to smile. This is the simplest way to get endorphin, the feel good hormone, flowing and to reduce levels of cortisol, the stress hormone. Our brain doesn’t distinguish between a real smile and a fake smile. So go ahead try it out. “Fake it, till you make it” has the best application here. Fake happiness until you are happy. People close to me know that when I smile the most I am stressed the most! Interested in learning more? Check out this article in Fast Company. “I wish I had” … Complete this sentence. You may come up with many different completions. These are your wishes that for whatever reasons you could not fulfill. That’s okay. It is what it is. You have no control over past. The best you can do is forgive yourself and move on. If there were others to blame for an unfulfilled wish, forgive them and move on. Forgiveness has many psychological and physical health benefits. Mayo Clinic has a good listing of those benefits. Bottom line “let it go”. While you are it, forgive yourself for not staying on top of your resolutions thus far. Now complete this sentence “I wish I could”. Think, what you could be doing now so these “I wish I could” statements do not turn into “I wish I had” statements. Take action now to translate the “I wish” statements to “I can and I do”. Once you decide to do something, break it down into really small tangible steps … baby steps. Harvard researcher Teresa Amabile found that the single most powerful workplace motivator is small, daily progress. Collecting wins, no matter how small, can chemically wire you to move forward through a repeated release of dopamine, the motivation hormone. So, if your goal is to keep your office clean, make your baby step for today as small as you can – for example, today, I will clean up the top drawer or today, I will remove folders from the top right corner of my table. Try it out … give yourself the opportunity to overachieve.